O12 had this feature (right click on image -> image properties). How can I see the size (kb) of some image on the pages? As far as I know, you can's see it in such an easy way. The only way I know is to go to the image url, open developer tools (Ctrl + Shift + I), click on the "Resources" tab, Expand "Frames" and every expandable item in it until you come to the actual picture. 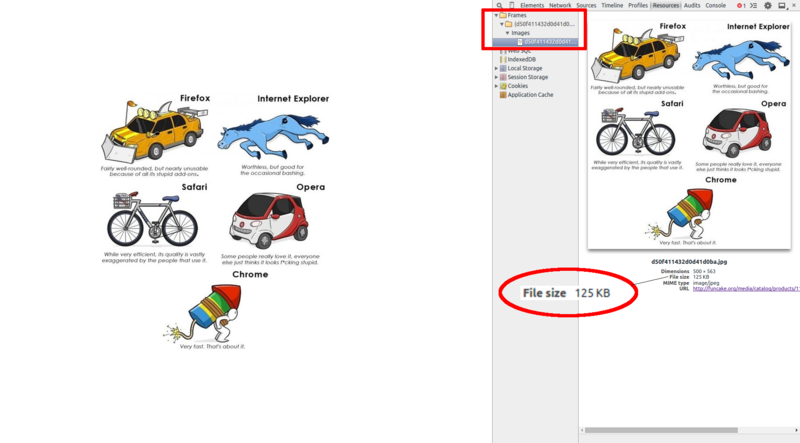 Click on it, and there you will see "file size". I found an easier (but related) option by accident: right click on the image, select the bottom option "Inspect element" and you'll be taken to the same tool as you mentioned here, with the exception that it'll automatically focus on the img HTML statement. Hovering on the image url then allows you to see the image dimensions as you already explained. But if the user want to see the dimensions of the image, I totally agree with that it is a much better way. Hopefully it will be integrated to Opera.